The harsh winter continued and the confections of snow so characteristic of the mountains, stretched down to our lowland farm. Twice we had deep snow and in its absence frosts whitened the fields. A good, cleansing winter with hard frosts is very welcome in the vegetable garden, knocking back slugs and other pests; beetroot and parsnips continued to keep well and the leeks were superb, tightly furled and free from splits. When the ground was dry and hard, we opened the gate and let the cattle kick around in the field. In recent years, we have become accustomed to seeing several inches of lush grass growth by the end of February, but this year the fields did not even look green. We are low on hay, and high on muck! 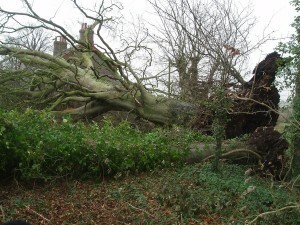 We were faced with sorting out the aftermath of ‘the fall of the giants’, when the winds blew down two huge beech trees. We had to take down two more for safety reasons and ended up with a huge piles of chippings and logs for several winters. We collected a large trailer-load of chippings, which we tipped above the cattle shed and shovelled onto the floor; this has given the cattle a warm, dry bed and reduced the amount of old hay and straw we need to spread to keep them dry. This entry was posted on Sunday, February 28th, 2010 at 7:56 am and is filed under Diary. You can follow any responses to this entry through the RSS 2.0 feed. Both comments and pings are currently closed.